Let's talk about games. Let's make some games. There’s an Old Who two-parter that I saw recently: Revelation of the Daleks. At the time I was feeling like an ugly mean-spirited little organism, and yet, in a metamorphosis I can only attribute to the esoteric workings of great art, it left me feeling genuinely joyful. 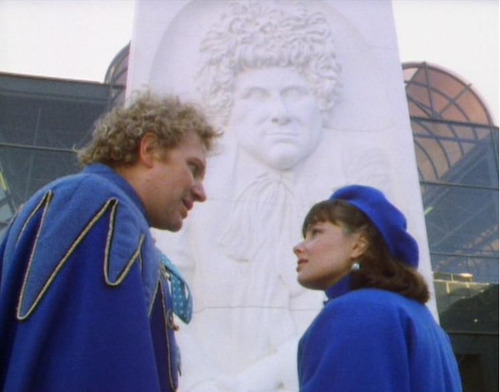 The Doctor is in front of a large monument carved with a portrait of – himself! PERI: Well, don’t you like it? It’s not a bad likeness. So why do I still feel that Revelation was fantastic? DALEK: It is the Doctor. DAVROS: Excellent. My lure has worked. DALEK: I shall order Daleks to detain him. DAVROS: No! It will give me the greater pleasure to watch his own curiosity deliver him into my hands. Yet there are some very silly moments. 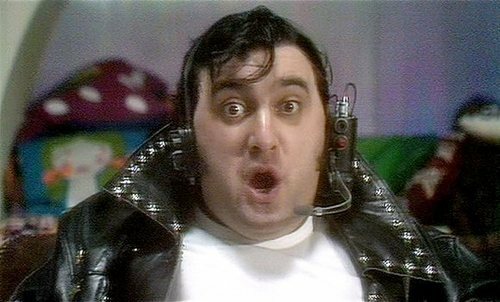 Revelation is ridiculous – from the Doctor’s gaudy coat, to Davros’ obscene tittering, to the loser of a DJ who kills Daleks with rock music. These camp morsels are enjoyable in and of themselves, but there is also something gripping about the juxtaposition between their levity and the darkness of the script; something quite uplifting that, in spite of all its silliness, Revelation doesnot feel itself unworthy of making statements about death, desire and capitalism. But it’s more than that: Saward seems sharply aware of how ridiculous Who can be. He actively toys with the audience’s expectations, pushing at the limits of what we are prepared to tolerate; he peppers the script with knowing comments about the crapness of it all. PERI: Well, it’s a gag. DOCTOR: Gag? Gag? Do you realise how much a thing like that would cost? Far too much for someone to play fun and games. And I thought I was good for a few more regenerations. PERI: Oh, Doctor, you’re covered in blood. DOCTOR: It’s not mine. Like the statue and this grotesque, it’s all part of an elaborate theatrical effect. Come on, we’ve got work to do. Skipping quickly over the fact that Davros apparently commissioned a non-lethal booby-trapped tombstone for the Doctor on the off-chance that he’d visit – doesn’t this seem like a defence of crappiness in Doctor Who? Its lack of realism is explained as an elaborate theatrical effect, and, in a moment, glossed over. “Come on”, says the Doctor, “we’ve got work to do”. So I have a theory. The combination of the three elements that I discussed above – quality, absurdity, and metacommentary – gives the audience permission to enjoy themselves. Quality helps us to excuse the crapness, and encourages us not to dismiss a scene or a plot thread because it has crap elements; it fulfils the contract with the audience that says: “we will not waste your time with something we haven’t tried hard to make well”. Absurdity creates a tonal space for the “so bad its good” humour to feed into – if a work is already ridiculous by design, then unintentionally ridiculous things like questionable SFX or cheesy plinky-plonky synth do not disrupt immersion. Finally, metacommentary allows the author to remind the audience that their work is artifice, and to sanction their enjoyment of that work: “it’s OK if you don’t worry about the details; just have fun with it”. And when this works, when this really works, I think that it not only creates a kind of artistic slack for crapness, an artistic storm drain to negate the influence of crap – I think it directs the crapness like an irrigation channel; I think this sort of permission-granting mobilises crapness. A thought experiment: would Revelation of the Daleks be any better if Peri’s “American” accent wasn’t an incessant grating blasphemy against the God of Suspended Disbelief? I have looked into the darkness of my soul, dear reader, and I could not help but answer, “no”. In the context of the qualities above, these elements of unpardonable crapness (Peri’s accent, Tasambeker’s acting, &c) are transmuted – they become charming, they become endearing, they make me feel like the work is honest, and audacious, and unique. For me, Revelation of the Daleks is the apotheosis of a particular Old Who experience: an enterprise which not only succeeds in spite of its crapness, but because of it. And for someone who rediscovers that at times they are an ugly, and harmful, and fundamentally compromised human being, it is profoundly nourishing to know that our flaws can be more than just stains or marks of shame: we can mobilise crapness, we can conduct an alchemy of the soul. (Note: this was originally posted on my tumblr - June, 2013).